Pottery or stoneware, relief, 0.5L, inlaid lid, signed “PD” (Peter Dümler). 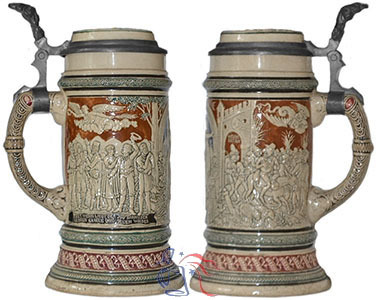 The central image on this anti-Semitic stein depicts Germania, an ancient symbol of German culture, standing on the Talmud, Judaism’s primary source of religious law and theology. The scene on the left portrays a celebration with an angel overhead. On the right is a derogatory depiction of Jews being driven out through a city gate captioned “Weiche Satan” (depart Satan) while a creature from the underworld flies above. 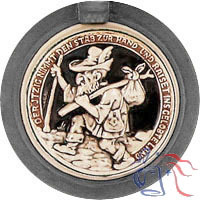 The lid inlay presents a denigrating caricature of a Jewish man hiking to the “Promised Land” with a bag on a stick labeled “1100000”. See also Nos. 67, 299 and 300.